Images from the series played at Cady Arena in Oxford, Ohio, on Jan. 27-28, 2017. All photos by Cathy Lachmann/BoB. 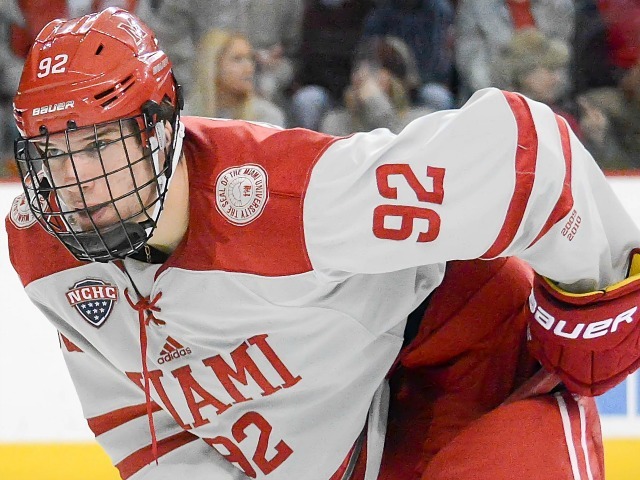 OXFORD, Ohio – Despite being outshot by more than a 2-to-1 margin in the series finale, Miami salvaged a win and split the weekend series. 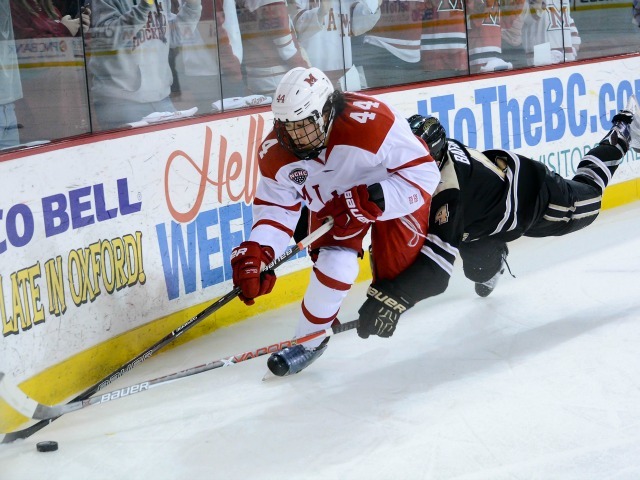 The RedHawks lost on Friday but edged Western Michigan, 4-3 at Cady Arena on Saturday. And at the risk of sounding blasphemous, the Broncos were the better team this weekend. 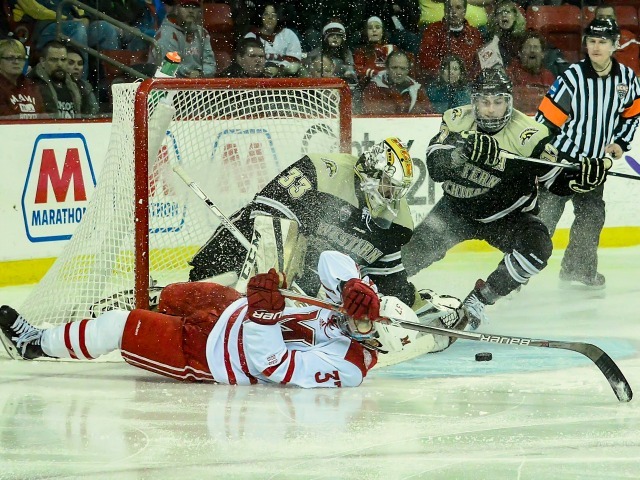 To go one step further, WMU is the better team at this point of the season. The Broncos piled up 79 shots in two games while holding Miami to 40. They were in the offensive zone more, made better passes, got sticks in the lane more often on defense and were superior at keeping would-be goal scorers from getting good looks. There’s a reason Western Michigan is No. 10 in college hockey. 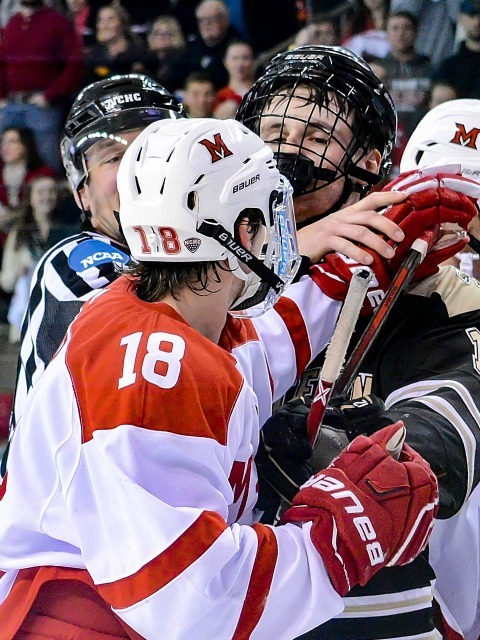 To Miami’s credit, it had success getting behind the WMU defense, scoring shorthanded on a 3-on-2 and again on a penalty shot resulting from a shorthanded break by Josh Melnick (which is not technically a SHG – not sure hockey’s scoring rules make sense there). Anthony Louis beat the D as well, passing to Willie Knierim for a goal. 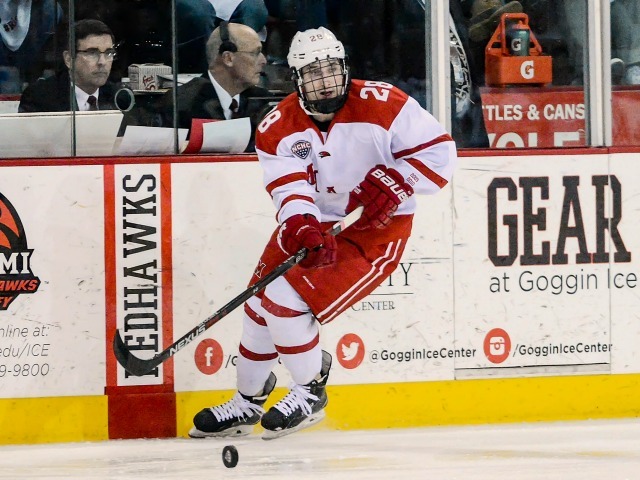 The RedHawks were extremely opportunistic on the power play, going 2-for-3 on Saturday, with Grant Hutton burying one from the blue line and Melnick somehow tipping home a laser pass from Kiefer Sherwood at the top of the crease. And, of course, there was Ryan Larkin. The freshman goalie was 30 of 31 through two periods in Game 2 before two tipped pucks beat him in the third. But without Larkin in net, Miami likely would not have earned a point this weekend. This is the challenge that awaits the RedHawks in each of their final eight regular season contests. They will need to find a way to win more close games than they lose against some of the top teams in Division I, teams that are frankly better than Miami right now. They will need to play their best hockey of the season every period, and can’t afford starts like the on they had on Friday or their finish on Saturday to earn much-needed wins. Fortunately for Miami, a hot goalie can neutralize a better team, and the RedHawks have a netminder capable of stealing games like he did in this one. – Standings: All eight teams in the NCHC have played 16 leagues games, or two-thirds of their 24-game conference schedule. 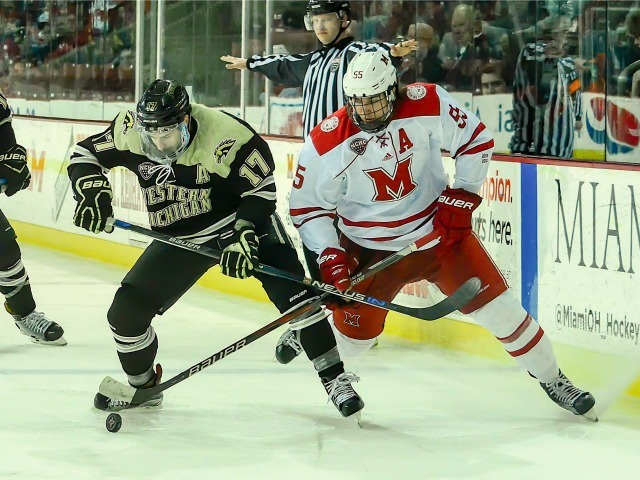 Miami trailed Western Michigan by five points heading into the weekend, and with both teams earning three points, WMU returned to Kalamazoo leading by the same margin. The RedHawks did pass St. Cloud State, moving into sixth before heading north to face the Huskies. Miami is up to 22nd in the PairWise and needs to go three games over .500 the rest of the way to be eligible for an at-large bid to the NCAA Tournament. – Miami has just one even-strength goal in its last three games. 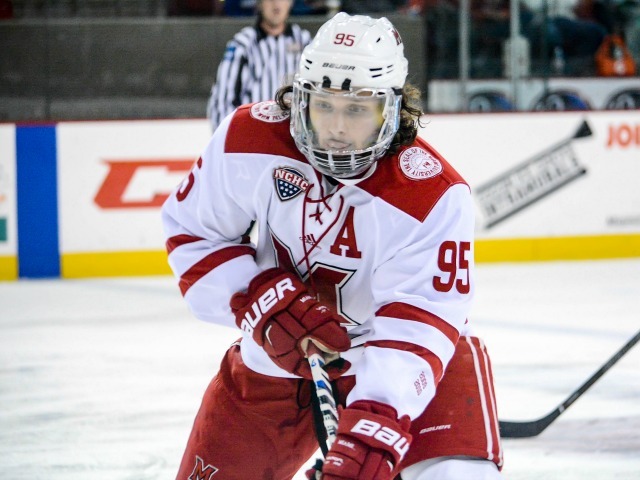 It scored five times this weekend after being shut out in its finale at Nebraska-Omaha, and the RedHawks netted two power play goals, one shorthanded and another on a penalty shot this weekend. Knierim has recorded the only even-strength goal for Miami in that stretch, and it was also his first career game winner. – Hutton’s PPG was just the fifth this season by a Miami player not on the first unit (Melnick-Sherwood-Louis-Carson Meyer-Louie Belpedio). Hutton has two goals on the man advantage, Scott Dornbrock has one and just two have been scored by non-defensemen not among those four on the first unit (Justin Greenberg and Gordie Green, one each). – Miami’s weekend high for shots in a period was 10. Western Michigan eclipsed that in five of the six. – There was little flow in this game, which took 2:34 to play and featured 79 faceoffs. FORWARDS: B-. It’s hard to argue with results, and this corps did score three times, including two goals by Melnick. When this team hits, it tends to play better, and we saw plenty of contact dished out by Ryan Siroky, Conor Lemirande and others. Still, just 15 shots for 12 forwards, and they did little to prevent WMU from racking up 47 shots. And then there’s their 28-51 record on faceoffs. If it wasn’t for their shot efficiency their grade would be significantly lower. DEFENSEMEN: C. Hutton scored on a sweet wrister, and Colin Sullivan picked up an assist on his Hail Mary pass. But then there’s the 47 shots allowed, which this group bears a substantial amount of responsibility for. Louie Belpedio was better than on Friday but still isn’t quite in top form. Chaz Switzer was back in the lineup and was once again improved over the first half of the season. GOALTENDING: A-. Could be the first A-range for a goalie surrendering three goals on this site. Even though he allowed three goals, Larkin won this game for Miami. He turned 44 shots aside, including a spectacular save on a late chance by the Broncos. Larkin controlled almost every rebound, an impressive feat since a lot of the shots he faced had mustard on them. LINEUP CHANGES: The only change for Miami was Alex Alger returning to the fourth line, while Bryce Hatten was scratched. Justin Greenberg was out for the fifth straight game, and was seen in the concourse wearing a boot on his foot, which he did not put any pressure on. He will obviously miss at least a couple more weeks, and his faceoff prowess and defensive and PK skills have been sorely missed by the RedHawks. Grant Frederic also did not dress for the second consecutive contest. OXFORD, Ohio – In its final regular-season meeting against No. 10 Western Michigan, Miami finally earned its first win of 2016-17 vs. the Broncos – barely. 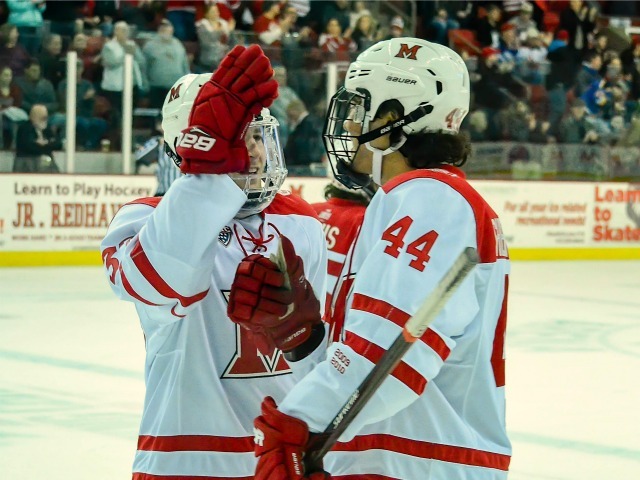 Thanks to Josh Melnick’s two-goal performance, the RedHawks took a three-goal lead into the third period and held on for a 4-3 victory at Cady Arena on Friday, as they wrap up their pre-playoff slate 1-3 against WMU. Miami (9-11-6) took the lead just 1:38 into the game on the power play when Grant Hutton and Gordie Green traded passes at the blue line, and Hutton whipped a hard wrist shot that found the net. 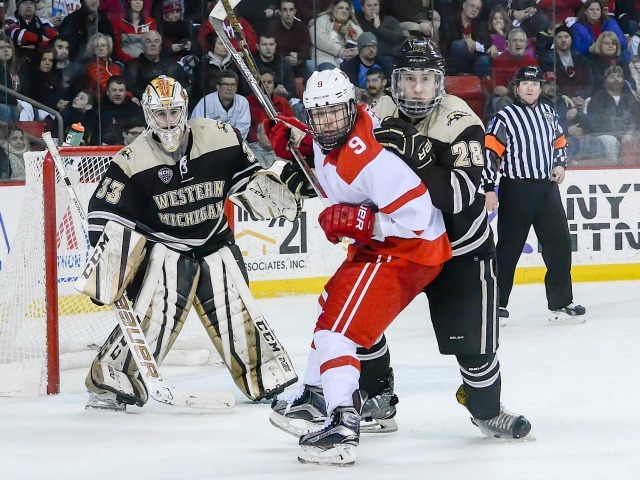 But just 21 seconds later, the Broncos (14-7-3) tied it when a Colt Conrad corralled a missed WMU shot at the side of the net, wrapped around the cage and shoved it across the goal line. With 17 seconds remaining in the opening period, Miami went ahead for good as Kiefer Sherwood fired a slap pass to Josh Melnick, who tipped it in from the top of the crease on the man advantage. Melnick extended the lead to two just 1:19 into the middle stanza when he was hauled down on a shorthanded breakaway and converted the ensuing penalty shot, beating goalie Ben Blacker on the forehand after slowing down as he approached the net. The RedHawks made it 4-1 less than four minutes later. Colin Sullivan fired a pass the length of the ice, which was chased down by Anthony Louis, and Louis dropped a pass to trailer Willie Knierim, who was at the side of the net. 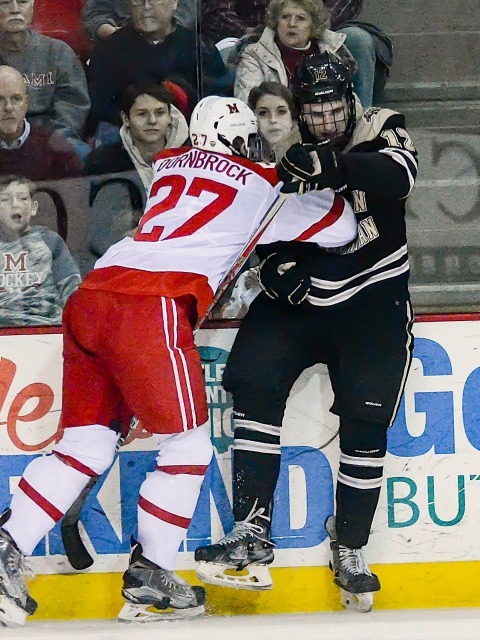 Knierim poked at the puck once, and the rebound sat in the crease momentarily before Knierim buried the rebound. 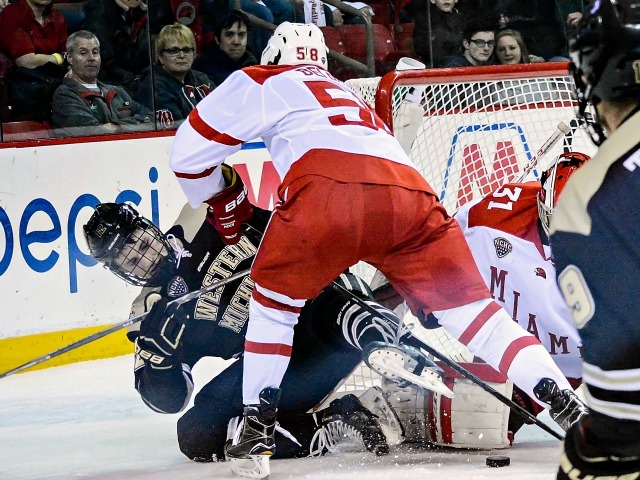 Les than two minutes into the third period, Western Michigan’s Sheldon Dries tipped a blueline pass from Cory Schueneman through the legs of Miami goalie Ryan Larkin, cutting the RedHawks’ lead to two. Five minutes later, the Broncos’ Neal Goff netted his first goal of the season as his slap shot from the blue line deflected off a Miami skate and into the corner of the net to make it 4-3. Larkin stopped 44 shots, including one on a blast from the edge of the faceoff circle late in the third period to preserve the lead, for his second-highest save total this season as Miami snapped a four-game winless streak. It was the second multi-goal game of Melnick’s career. His other one also came this season and at home in a 3-2 win over St. Cloud State on Jan. 6. Knierim netted his fourth goal of the season, with all coming in his last 13 games. Hutton recorded his sixth marker of the campaign. 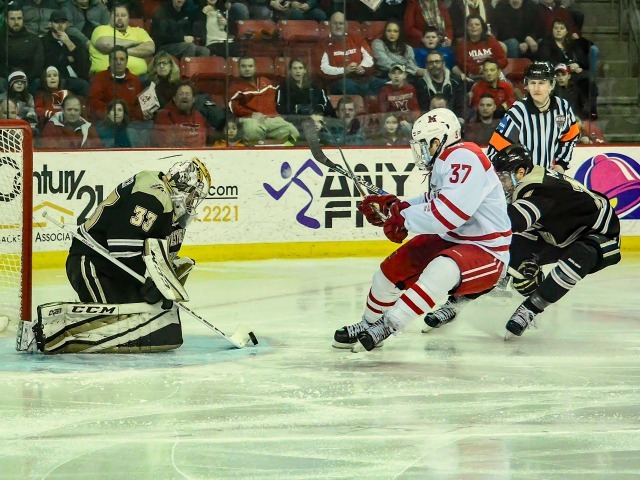 The RedHawks moved into sixth place in the NCHC, passing SCSU, which lost on Saturday. Miami moved up two shots to 22nd in the PairWise rankings. MU is off next week and heads back to the road for a weekend set at St. Cloud State on Feb. 10-11. 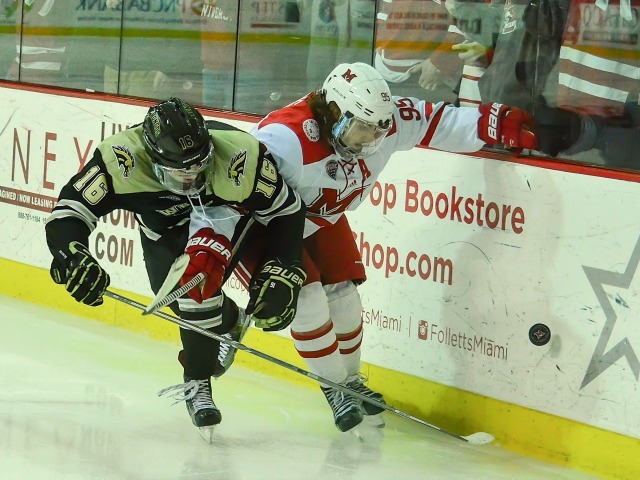 OXFORD, Ohio – Western Michigan continued its in-season dominance of Miami on Friday. The No. 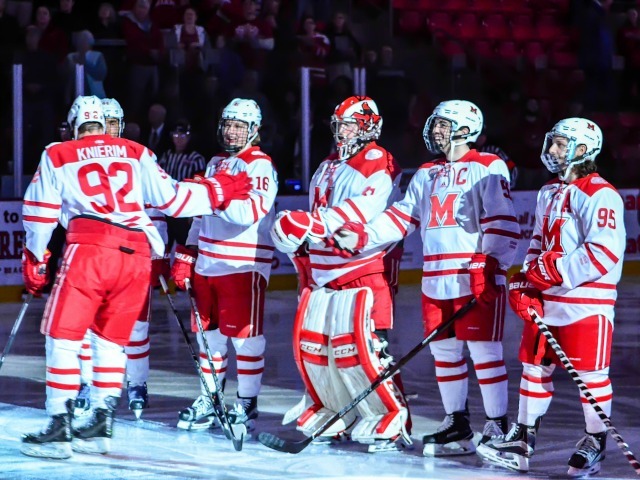 10 Broncos held off the RedHawks, 2-1 at Cady Arena in the first game of a two-game weekend set, extending Miami’s winless streak to four games. MU is now 0-3 against Western Michigan this season, and has been outscored, 13-6 by the Broncos. After WMU controlled play early, Cam Lee’s wrister found the corner of the net 6:01 into the first period to open the scoring. Miami’s Louie Belpedio (photo by Cathy Lachmann/BoB). 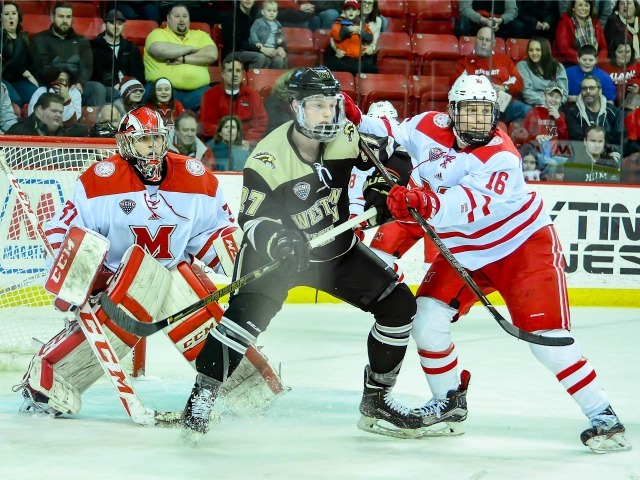 The Broncos (14-6-3) had a would-be marker in the final seconds of the opening frame waved off after a 14-minute review, as WMU was ultimately declared off-side. Western Michigan outshot Miami, 16-4 in the first 20 minutes. The RedHawks (8-11-6) tied it on just their second shorthanded goal of the season, as Kiefer Sherwood held the puck along the boards before finding Grant Hutton on the left wing, and Hutton slid a pass across the slot the Louie Belpedio, who buried it 8:15 into the second period. 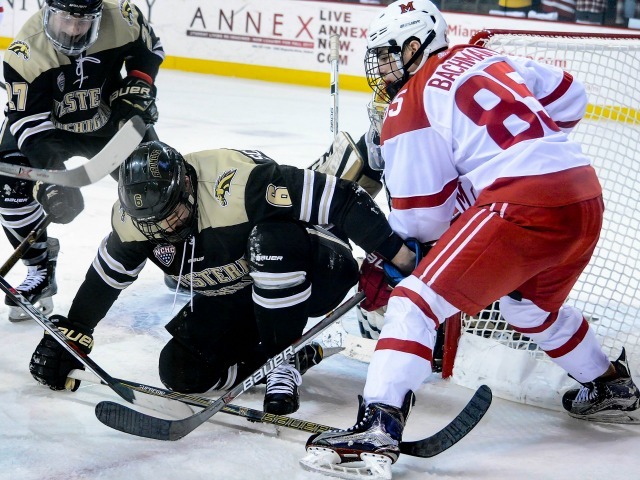 But the Broncos answered less than four minutes later when Wade Allison’s pass from behind the Miami net found the stick of Hugh McGing, who tapped it into the side of the cage to give WMU the lead for good. 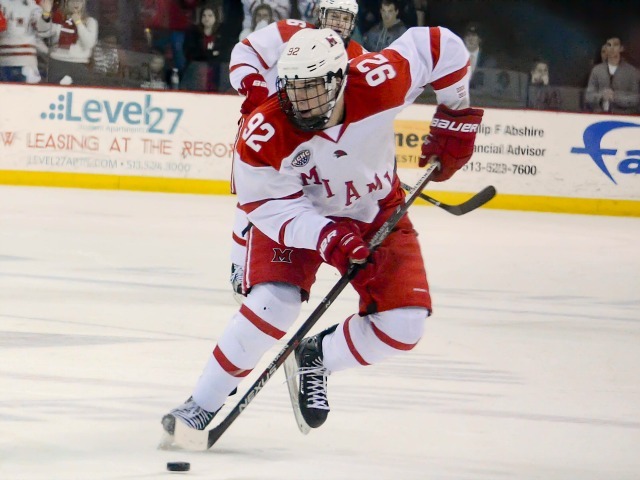 The RedHawks remain in seventh place in the NCHC, one point behind St. 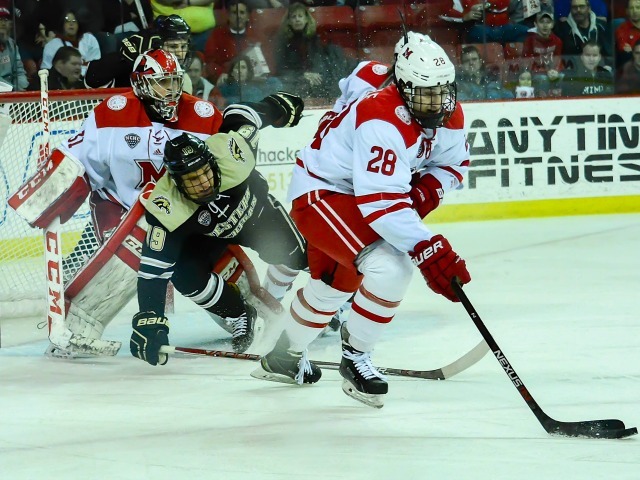 Cloud State and 10 ahead of cellar dweller Colorado College with nine league games remaining. 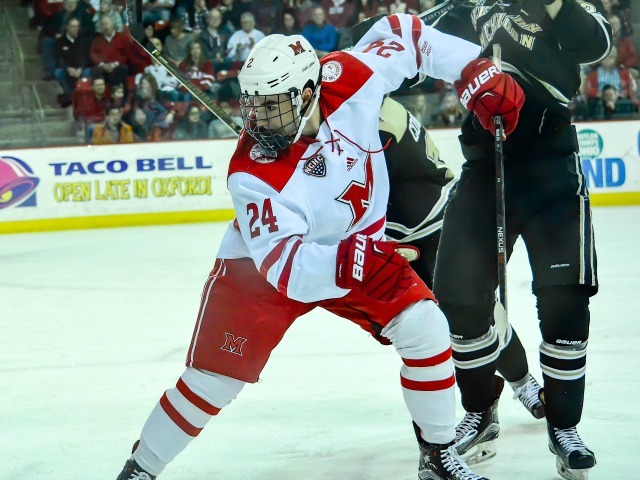 Miami also slipped another spot in the PairWise rankings to 24th. The RedHawks would need to improve to at least No. 14 to warrant NCAA Tournament consideration. Belpedio’s goal was his third in five games and sixth of the season. Sherwood, second on the team in points with 26, had been held off the scoresheet three straight games. These teams wrap up their weekend series at 7:05 p.m. on Saturday. A season of extremes continues for Miami. Since up a four-game road stretch with a 6-3 comeback win at North Dakota, courtesy of five straight third-period goals on Jan. 14, the RedHawks went 0-2-1 to wrap up the away set. That was capped off by a 2-0 loss at Nebraska-Omaha on Saturday, representing the first time Miami has been shut out by an opponent this season. A quick season recap: The RedHawks lost their season opener and were unbeaten in their next five (3-0-2). Then came Miami’s longest winless streak in a quarter century, a 10-game skid in which the team was 0-7-3. But wait, the RedHawks won their next five. And now Miami is winless in its last three, having scored just three goals in that span. Normally in this league good teams can absorb this types of hiccups, but because of the RedHawks’ 3-8-5, they can’t afford them. Yes, Miami is a good team, with the potential to be a very good team, but the Coach Enrico Blasi and the RedHawks truly have their backs up against the boards. 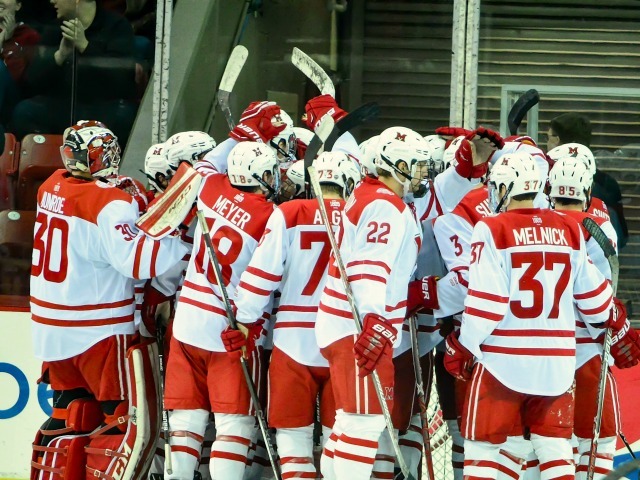 They have one of, if not the, toughest remaining schedule of any team in college hockey. We went through the final five opponents yesterday. And without advancing to Minneapolis and the Frozen Faceoff, Miami would need to finish 7-3 and take its first-round NCHC opponent to three games just to warrant NCAA consideration. A 6-4 finish and the RedHawks would need to qualify for Minny and win a game there at the bare minimum. Of course there’s another way: Paraphrasing Major League for the tiny tots that may be reading, win the whole thing. That is, the NCHC Tournament. So there are multiple paths to Cincinnati and the NCAA regionals, but they are as smooth as the late third-period ice at Value City Arena. With the importance of the Miami’s remaining 10 games, in a way, the RedHawks’ playoff season has already begun. – So in terms of standings, this loss hurts because UNO is now four points ahead of Miami, which is a difference of multiple wins. Even if the RedHawks had tied and lost the sideshow events, they would’ve gained a point and remained within two points of the Mavericks. It’ll be a lot harder to catch them now. 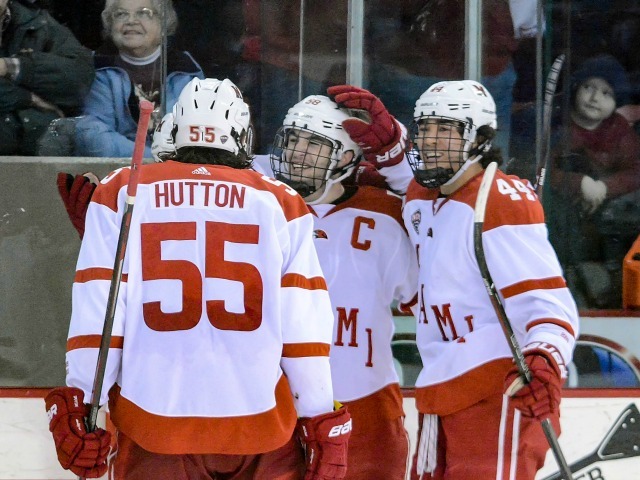 Getting into the top four is so important because it means home-ice advantage for the first round of the NCHC Tournament after teams have flown across the midwest for five months in addition to carrying full class loads. A 7-3 finish should do that, considering Miami plays most of the teams it is competing with for seeding down the stretch. Hey, at least six of the final 10 are in Oxford. 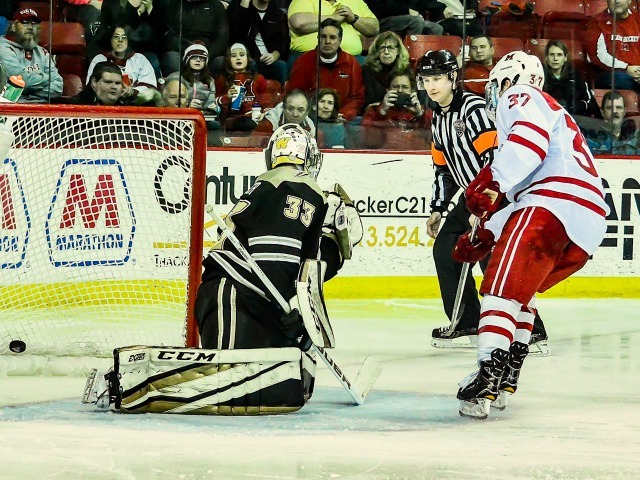 – The RedHawks deserved a better fate than being blanked in this one, but Evan Weninger stopped 30 shots to post the zero. It happens from time to time, especially on the road. 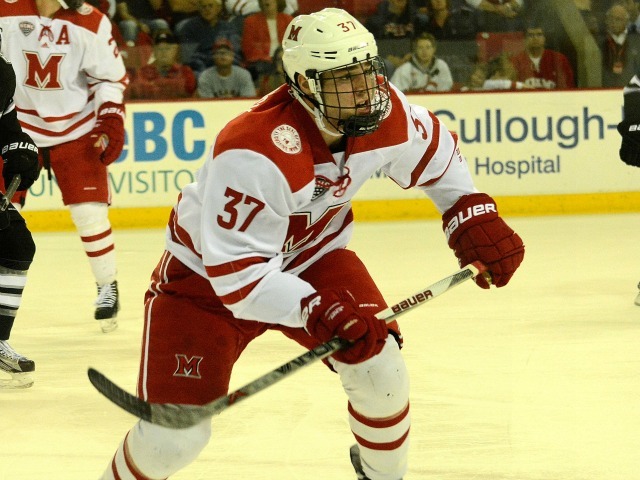 – On the first goal, Steven Spinner – which is tough to type for a Miami fan/writer because the tendency is to type Steven Spinell – made an incredible backhand pass across the top of the crease. Anthony Louis was way late covering the goal scorer, Frederik Olofsson. – On the second goal, Louie Belpedio just turned it over at the blue line and Spinner went in for a sweet breakaway goal. This is the third time the captain has coughed one up that has directly resulted in a goal against. – The same 19 from Friday’s lineup card dressed on Saturday. That meant a third straight game without Justin Greenberg. – So Saturday’s game was supposed to be televised on Fox College Sports, but it was unavailable to much of the country, including those (like myself) who have DirecTV and the premium sports tier. But five of the next seven Miami games will be televised nationally, including Friday’s games, which will be carried on CBS College Sports. 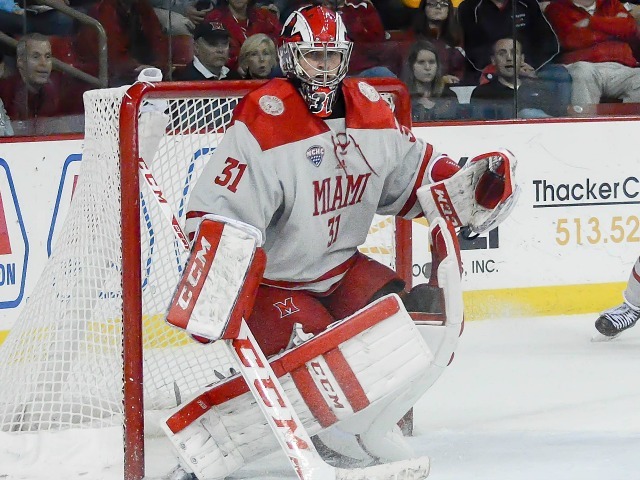 Despite putting 30 shots on net, Miami suffered its first shutout of the season on Saturday. Nebraska-Omaha was outshot, 30-22 but blanked the RedHawks, 2-0 in the series finale at Baxter Arena. It was the first time Miami (8-10-6) had failed to score a goal in 26 games. The last time it was shut out was on March 4, 2016 at Minnesota-Duluth. The Mavericks (14-8-4) were able to win without scoring at even strength. With 1:44 left in the first period and in the closing seconds of a power play, Steven Spinner controlled the puck at the top of the crease and backhanded a pass to a wide-open Frederik Olofsson, who tapped it in to open the scoring. While the RedHawks were on their own man advantage, defenseman Louie Belpedio lost the puck at his own blue line, and Spinner skated in alone and scored on the backhand with 6:46 to play in the second period. That was all the offense UNO needed, as Evan Weninger stopped 30 shots to earn the shutout. 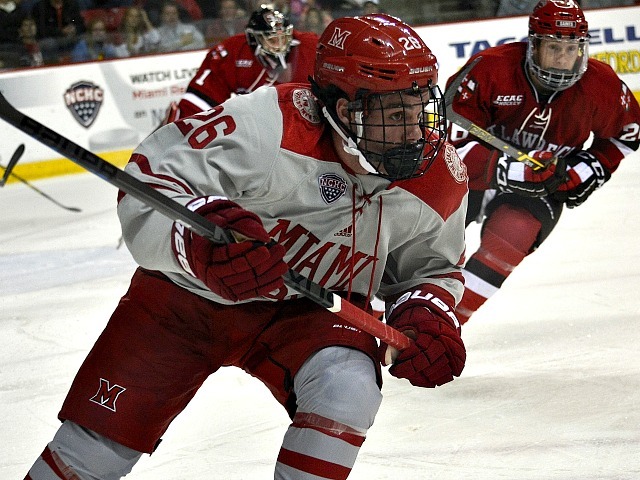 Miami remains in seventh place in the NCHC, but it dropped one spots to 22rd in the PairWise rankings. Anthony Louis saw his season-high eight-game points streak snapped. After four straight road games in which the RedHawks went 0-3-1, Miami will host Western Michigan in a pair of games next weekend. Another tie moved Miami into a tie for the NCHC record for most ties in a season. 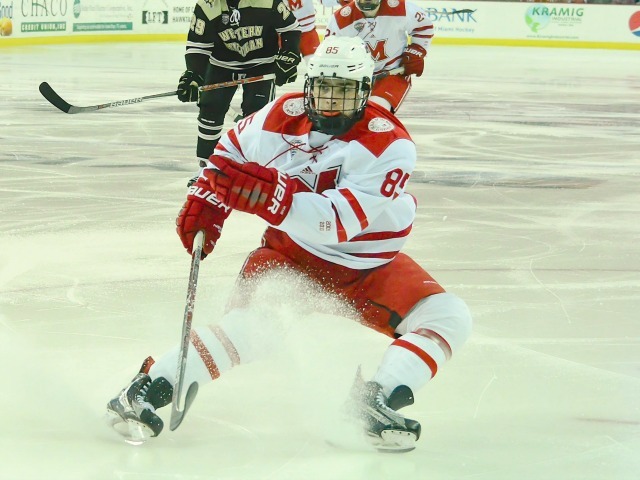 The RedHawks played in their ninth overtime contest of the campaign as they skated to a 3-3 draw at Nebraska-Omaha on Friday. 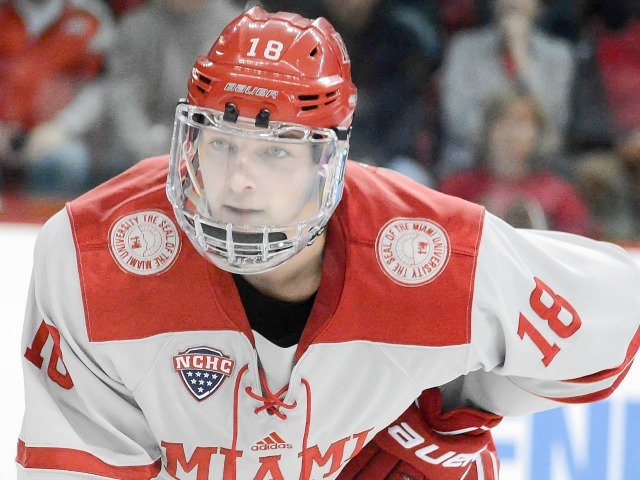 Several teams have finished with six ties since the NCHC’s inception in 2013-14, but Miami has a great chance of establishing a new league mark since it still has 11 games remaining in its regular season. 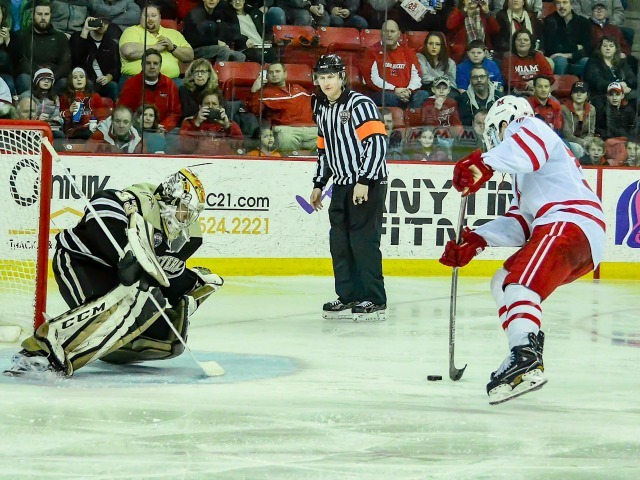 The NCAA record is 10 stalemates, held by three teams including current conference foes Colorado College and Western Michigan. The Mavericks (13-8-4) scored twice in a 59-second span midway through the first period. Steven Spinner whipped a shot from the high slot that appeared to deflect off the skate of the RedHawks’ Ryan Siroky and into the net 9:32 into the game. 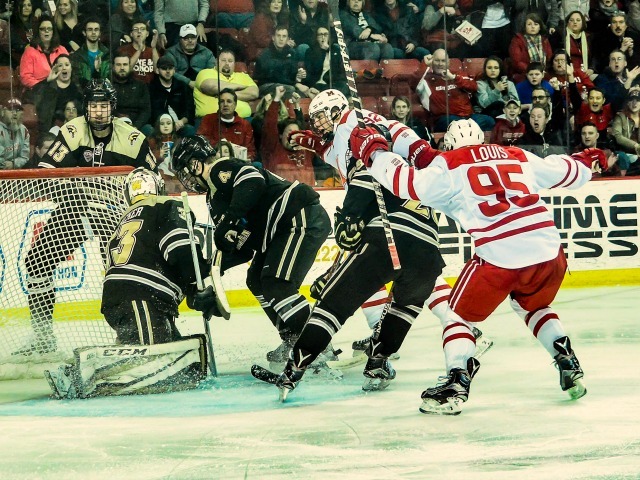 Justin Perizek’s shot from the side of the net was stopped by RedHawks goalie Ryan Larkin, but the rebound came to Teemu Pulkkinen, who batted it in with 9:29 left in the opening frame. With 2:47 left in the first period, Anthony Louis fed Louie Belpedio for a one-time blast on the power play as Miami cut the lead in half. The RedHawks (8-9-6) tied the score at two with 8:16 left in the opening stanza as Scott Dornbrock fired a shot from the blue line that was knocked down in the slot, and Willie Knierim corralled the rebound, wiring one just under the crossbar. 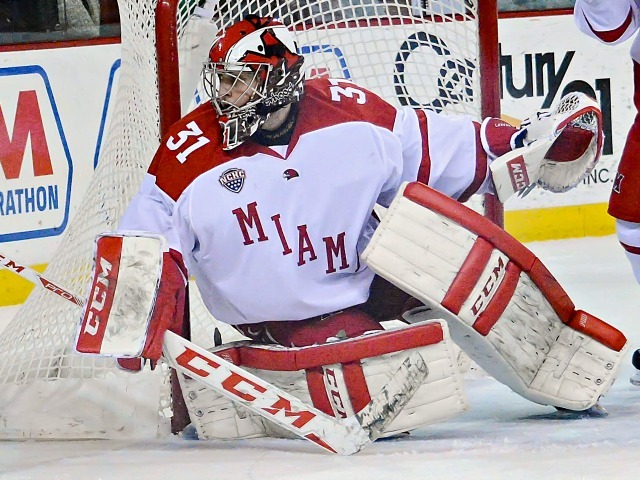 Miami’s Carson Meyer (photo by Cathy Lachmann/BoB). 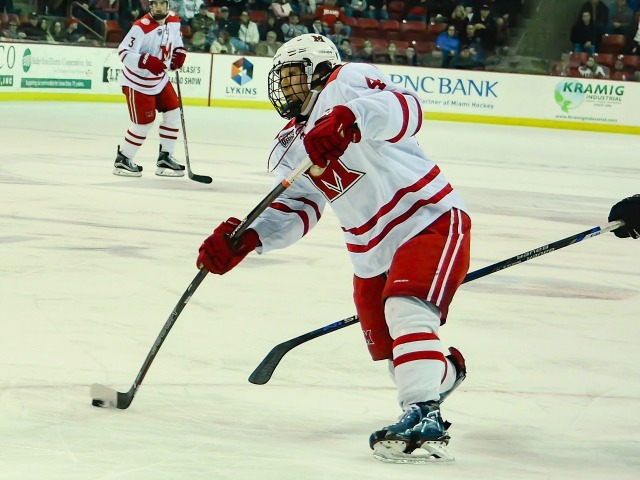 Miami took its only lead of the game 21 seconds into the third period, as Louis centered a puck to the top of the crease for an off-balance Carson Meyer, who acrobatically tapped the puck home. On a power-play rush, the Mavericks evened it at three as Austin Ortega fed Jake Randolph at the side of the cage for a one-timer with 6:16 remaining in regulation. The RedHawks earned the extra point late in overtime as Gordie Green slid a pass to Dornbrock on the left wing, and Dornbrock played the puck off his skate to his stick before burying it. 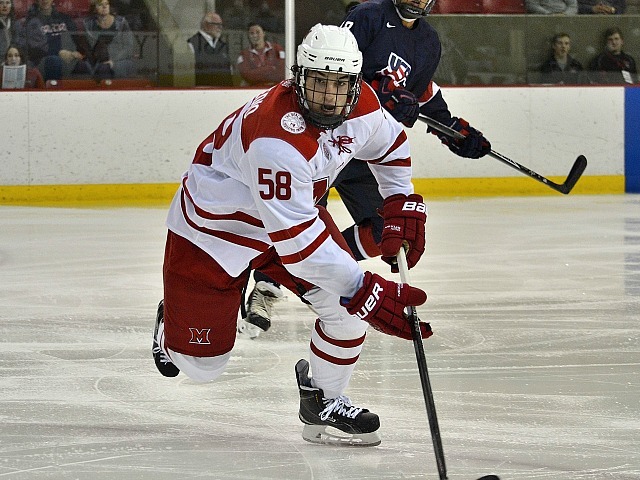 Meyer finished with a goal and an assist, and Louis also tallied two points – both on helpers. Meyer has points in nine of 10 games since returning from his illness, going 5-7-12 in that stretch. Louis extended his points streak to a team-best eight games. He has four goals and eight assists during his streak and four multi-point games in his last five contests, giving him 117 points for his career, 35th on the team’s all-time leaderboard. Miami started the game with three straight power plays, scoring on one, but UNO had six consecutive chances on the man-advantage to end it, netting the tying goal on its fifth chance. Six ties for the season is one off MU’s all-time record. The team skated to seven draws in 2009-10, the last time it advanced to the Frozen Four. The RedHawks remain in seventh place in the NCHC but are just two points out third place in the ultra-tight conference. These teams wrap up their weekend series at 8:07 p.m. on Saturday. Miami again trailed, 3-1 after two periods on Saturday, but unlike the night before, there would be no late heroics. Neither team scored in the final stanza and the RedHawks fell at No. 7 North Dakota by that two-goal margin, splitting the weekend series. 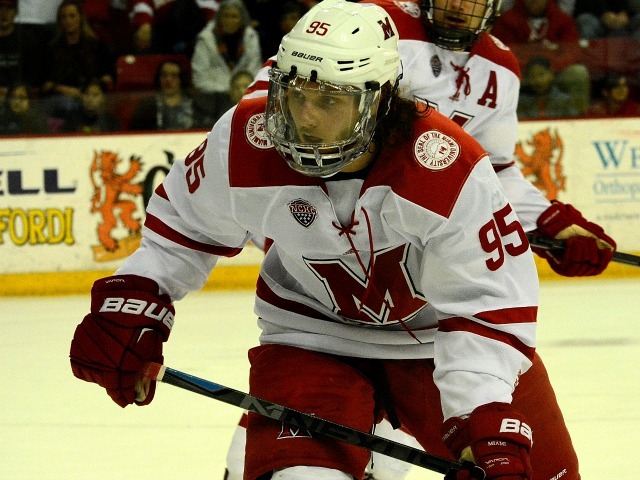 Miami had scored five unanswered goals on Friday to pull off a 6-3 win. The loss snaps a five-game winning streak and six-game unbeaten stretch. UND got on the board first, as Zach Yon took advantage of a turnover, fed ahead to Dixon Bowen who separated from his defenseman, skated wide toward to net and beat RedHawks goalie Ryan Larkin just 3:00 into the game. Miami (8-9-5) answered 44 seconds later, as Josh Melnick stole the puck along the boards and kicked it out to Carson Meyer in the high slot, who threw a pass to Anthony Louis at the side of the net for a one-time tap in. North Dakota (13-7-3) went ahead for good when Shane Gersich entered the zone and sent a pass to Tyson Jost, who slid one across the slot to Austin Poganski for a tap-in with 11:36 left in the opening frame. UND scored the final goal shorthanded, as Joel Janatuinen stripped Louis in the Miami defensive zone and dropped a pass to Rhett Gardner, who whipped one past Larkin with 15:47 remaining in the middle stanza. North Dakota dominated in shots, 34-15, reaching double digits each period while holding the RedHawks to six or fewer in all three frames. Louis’ goal gives him a seven-point point streak, the longest by any Miami player this season. He now has 115 career points, tied for 35th with Marty Guerin and Bobby Marshall on the all-time list. Melnick has picked up points in six straight games, with five markers and four assists in that span. 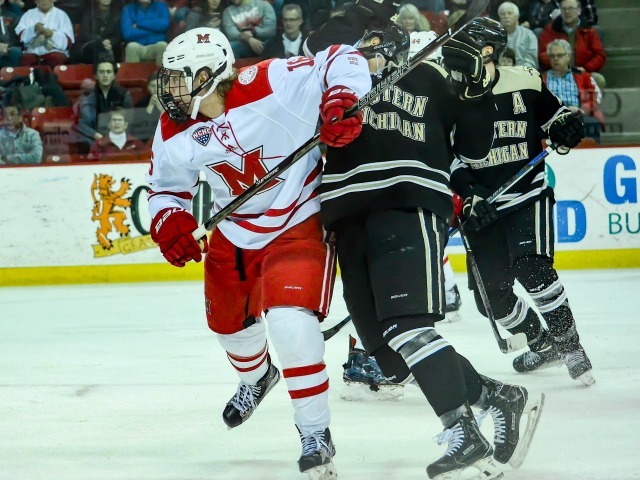 The RedHawks fell into a tie for sixth in the NCHC with St. 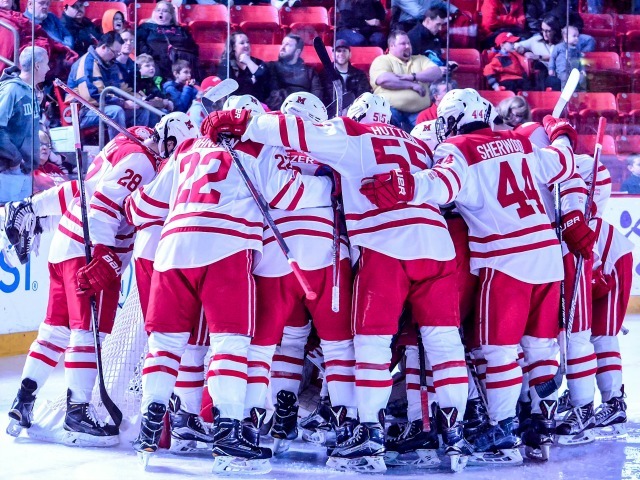 Cloud – as both have 16 points – and they slipped one spot to 21st in the PairWise rankings. Miami heads will head to Nebraska-Omaha for two games next weekend.